LabTAG has a range of permanent ink markers, for a variety of laboratory applications. This includes a flame-resistant permanent marker for metal surfaces, such as iron and stainless steel, ethanol- and alcohol-resistant markers, perfect for containers that are routinely disinfected with alcohol, and cryogenic markers for the identification of containers stored in liquid nitrogen and ultra-low temperature freezers. 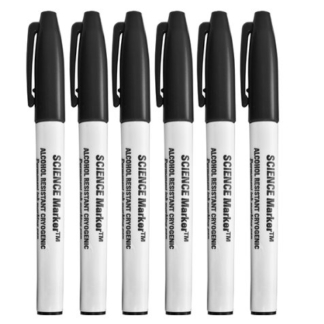 Our water-resistant cryogenic markers are available in either micro-tip or fine and extra-fine tip, dual point versions. Markers are available in assorted colors.